As Christians, we do a lot of good things together. It has been said that our character is what we do when we are alone—when no one is watching. 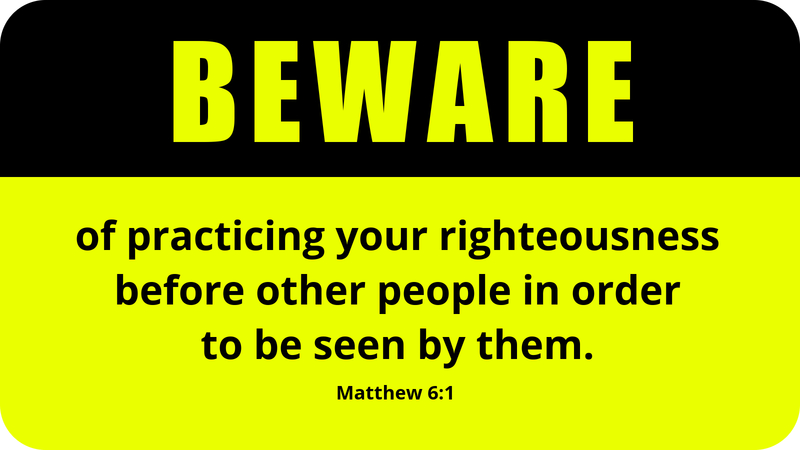 In Matthew 6, Jesus speaks about our intentions when doing “acts of righteousness.” Such things should not be done simply for the sake of being seen by others. There is a balance that Christians need to maintain. Leading by example is important where influencing others is concerned. Worship, prayer, fellowship, and ministry in the presence of others are things we are called to do. But, Jesus cautions us against letting our Christian expressions slip away when we are not in the presence of others. When we are alone, the true character of our faithful relationship with our Father in heaven also becomes evident. Communication is a chief characteristic in our most intimate relationships. In loving relationships we learn and share much about each other through regular dialogue. The same applies in our relationship with our loving God. How much of your private time do you set aside for nurturing your relationship with your Father in heaven? He is patiently waiting and looking forward to sharing that time with you. Prayer: God of love and grace, guide us into deeper levels of understanding and relating to you in our private moments of self-giving, Bible study, prayer, and devotional reflection. Amen. Today’s devotion was written by Robert V. Alle, NALC Pastor in Hickory, NC.